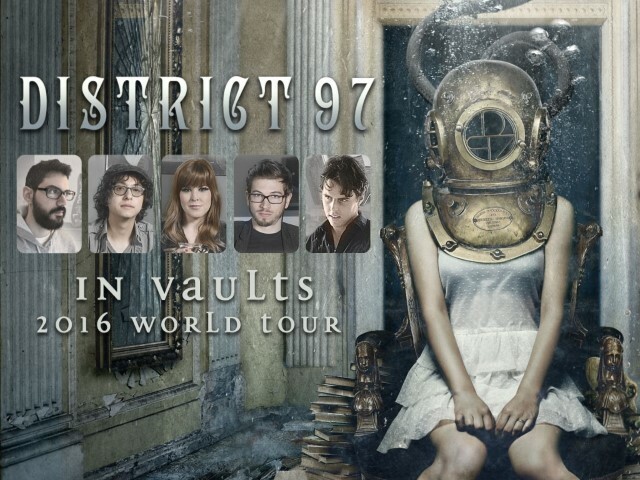 DISTRICT 97 is undoubtedly the most musically adventurous rock band in the world to feature an American Idol Top 10 Female Finalist. The release of 2012’s critically-acclaimed Trouble With Machines ushered in an exciting era for the Chicago-based Progressive Rock band; In 2013, the band toured both Europe and the US with legendary bassist and vocalist John Wetton (King Crimson/UK/Asia), which was documented on 2014’s live release, One More Red Night: Live in Chicago. 2013 also saw the band nominated for a Breakthrough Artist Award by Prog Magazine. Rather than rest on their laurels, District 97 took to the studio in 2014 to record the new material they’d been honing at home and on the road. The resulting album, In Vaults (released in June 2015), continues and accelerates the upward trajectory of great songwriting and incredible musicianship that’s been evident since the band’s 2010 debut, Hybrid Child. One listen perfectly illustrates why John Wetton says, “I’ve said it before, and I maintain that D97 is the best young progressive band around right now. Gifted players, great material, and a brilliant, charismatic singer in Leslie Hunt. DISTRICT 97 was formed in the fall of 2006 by drummer Jonathan Schang, keyboardist Rob Clearfield, bassist Patrick Mulcahy and guitarist Sam Krahn (replaced in 2008 by current guitarist Jim Tashjian). The foursome from Chicago honed a no-holds barred style of Liquid Tension Experiment-inspired Instrumental Rock before deciding the right vocalist was needed to complement their sound; enter 2007 American Idol Top 10 Female Finalist, Leslie Hunt. With a look, sound and stage presence comparable to a young Ann Wilson from Heart, Leslie’s dynamic performances pushed the band into a new direction that forged a unique marriage between accessible, catchy vocal melodies and an adventurous instrumental prowess. She was followed shortly thereafter by one of Chicago’s finest young guitarists, Jim Tashjian. With this new blend of charisma and stellar musicianship in place, their live shows over the past several years at festivals such as RoSfest and Prog Dreams II, and numerous appearances across the USA, UK and Europe cemented the band as a force to be reckoned with onstage, as well as in the recording studio. In August 2015, Rob Clearfield and Patrick Mulcahy left the group and were eventually succeeded by Andrew Lawrence and Tim Seisser, respectively. The new lineup will debut in tours across Europe and the US in 2016. Hailing from the fertile Detroit music scene, T I L E S features Chris Herin (guitar), Jeff Whittle (bass), Paul Rarick (vocals) and Mark Evans (drums). Formed in 1993 on the heels of a production deal with Gene Simmons of KISS, T I L E S has developed a structured-yet-spontaneous compositional style that blends the adventure of progressive rock with an aggressive hard rock edge. T I L E S has released five studio albums worldwide and recently commemorated their 20th anniversary with a pair of live recordings, “Off the Floor 01” & “Off the Floor 02”. The band has worked with renowned producer Terry Brown (Rush, Fates Warning) since 1997 and celebrated artist Hugh Syme (Aerosmith, Rush) since 1999. Their breakthrough third album “Presents of Mind” received praise from drummer Mike Portnoy who invited T I L E S to tour Europe with Dream Theater in 1999. 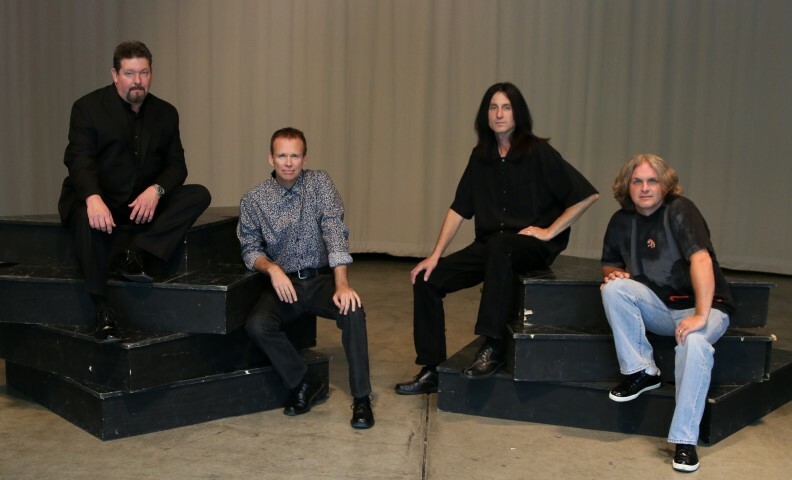 Over the years the band has been nominated for several Detroit Music Awards in the Best Rock Album category and 2008’s “Fly Paper” album features a guest appearance by guitarist Alex Lifeson of Rush. Destined to be on the radar of Prog fans everywhere, “Pretending to Run” is a distinctive presentation framed in the grand traditions of progressive rock. Clearly and unmistakably T I L E S, but infused with a more expansive sound as the guest artists propel the band into new directions sure to please fans old and new.